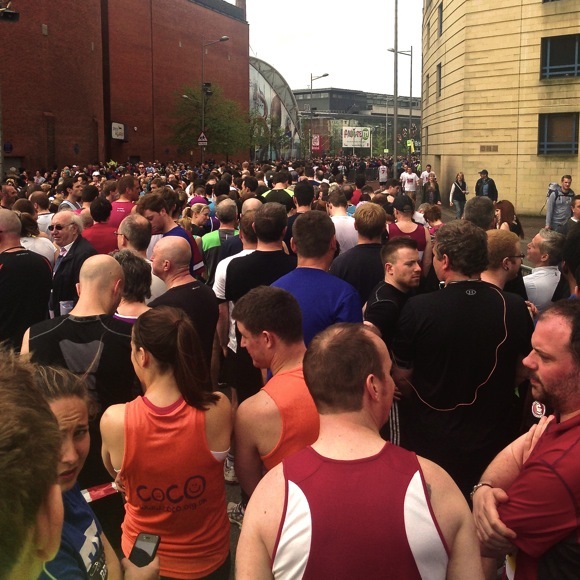 Back on the 5th of May, I ran the Bristol 10K. And then had a really busy week where I was out of the house a lot, so I’m afraid this race report is a little late. Sorry! This year’s 10K was a mixed bag for me. It was my slowest ever 10K race (though only by about half a minute — see my results page to look at all my race results.) It was also one of my most enjoyable. I’d expected to be slow this year. I’ve mostly been concentrating on distances, and my noble plan to lose some weight and gets lots of practice before the race was somewhat undermined by a couple of weeks of illness that put me off running for a while. So I figured I’d just take it fairly easy. Not only that, but my fastest 10K, last year’s, was mostly produced by running with my erstwhile boss Mike, who’s a bit faster than me. It was only because I had him as a pace‐setter that I managed to drag myself around in record time. And Mike didn’t run the 10K this year, damn it. But this year, I may still have benefited from Mike’s help. The bulk of the Bristol 10K runners start off in two batches, one earlier, one fifteen minutes later. I’ve always been in the later start, with the slower runners. When I opened my race pack this year, though, I saw a strange and alien colour on my race number. It was yellow. They’d put me in the earlier start! I’m guessing that last year’s time may have crossed some borderline between the slower stream and the faster, so I had the chance of setting off fifteen minutes earlier, in the first batch of runners. I was in two minds about whether to take advantage of this — if you’ve been assigned to one of the faster starting streams, you’re allowed to drop back into a slower one — but in the end I decided that I probably wouldn’t get in anyone’s way as long as I lined up towards the back. I made my way through the bustling start area to line up with the other yellows. That turned out to be a great choice, because it meant I had lots of company all the way around the 10K. For starters, I got to see all the front runners, from the elite athletes on, on their way back down the Portway as I was on my way up. Normally, the people with actual names rather than numbers pinned to their shirts are long gone by the time I get there. Also, in previous years, by the time I got to Cumberland Road on the way back into town, it felt pretty lonely. Most of the runners have pulled away from my slow pace, so it really thins out. This year, at the first hint of that thinning, on the way back down the Portway, I saw the second stream — the Red and Green starters — coming down the other side of the road, and knew that the faster ones would soon catch up with me. And so it was. Instead of the loneliness of the slow runner on the Cumberland Road, I ended up in the middle of the second stream of thousands of runners, and managed to stay with the bulk of them all the way around to the finish line. While it did feel a bit of a cheat, especially when I found out my sloooow time, it was a really pleasant change to be in amongst a whole bunch of runners from start to finish, rather than just at the start. And I don’t think I got in anyone’s way. As it turned out, checking the 10K site afterwards, “…very high numbers of runners in the Yellow and Red zones have the same predicted race time — which is why they are split between the 2 waves…” So perhaps it was both a faster time last year and a bit of luck on top that got me in the faster stream. Apart from being in the earlier set‐off, there wasn’t really anything too thrilling or terrible about the 10K this year for me. The weather was decent — clouds but no rain, so it wasn’t too hot — and the race well‐organised and the other runners friendly, as usual. Sadly, I’d guess I’ll be back in the generally‐slower pack next year. But if I pick back up my weight‐loss plans and my training, maybe I can find a way of keeping up with the pack without starting fifteen minutes ahead of half the runners… Seeing how the other half lives — with company all the way around — is quite a good incentive.